The Come-Back - Motorcycle Safety Institute of S.A.
You used to live to ride, but then life took a different turn–varsity, a family, a career–and you sold your bike and hung up your helmet for good. Or so you thought, because lately those old urges are coming back, and you find yourself driving out of your way to cruise slowly past motorcycle shops and gaze longingly at the bikes parked outside. We all know where this is going, don’t we? Before you fling your credit card at the first motorcycle salesman you see, understand how the motorcycling landscape has changed since you’ve been gone, especially the motorcycles themselves. They’re unquestionably better, with grippier tyres, more powerful brakes, fuel injection, great handling, first-rate suspension–and more power; a lot more power. The starter motor on a Gold Wing probably cranks out more torque than the engine in that British vertical twin you rode back in the day. Even experienced riders occasionally get in over their heads on modern bikes, which treat starry-eyed returnees the way lions treat gazelles. To avoid becoming road-kill, walk right past that mean-looking sport-bike and throw a leg over a standard street-bike instead. With less weight and more manageable power they’re friendlier to older riders who’ve been out of the game for a while. Motorcycles have become much more specialized, too, divided into task-specific categories such as cruisers, tourers, sport-bikes, and dual-sports. Finding a bike like the do-it-all standards you grew up with is a challenge, but the right bike might be hiding in plain sight. The adventure-touring segment is the fastest growing in the sport, and though they raise visions of round-the-world travel and sleeping rough under the stars, adventure tourers, with their sit-up riding positions and broad powerbands, are the spiritual successors of classic standards like the Z1, the CB-750, and the Triumph Bonneville. The number of cars on the road skyrocketed in the last couple of decades, as did the number of drivers texting, eating, applying makeup, and talking on their cell phones behind the wheel. Where street riding was once merely a challenge, it’s now a battle between you and an oblivious car-driving army wielding weapons of mass distraction. Your best ally in this fight is training. Don’t so much as ask the price of a new bike until you take a refresher course to blow the cobwebs off your riding chops. You might have been the local hot shoe back in the day, but if that day was more than a decade ago, you need to get your brain, your skills, and your muscle memory back up to speed. Buy current-spec riding gear––helmet, jacket, pants, boots, and gloves––even if you have to get used or closeout items. Protective riding gear has come a long way since that leather Fonzie jacket and Captain America helmet in your closet. As you age, your bones get brittle and joints stiffen up, so the kind of get-off you might have laughed off in your youth is no joke today. 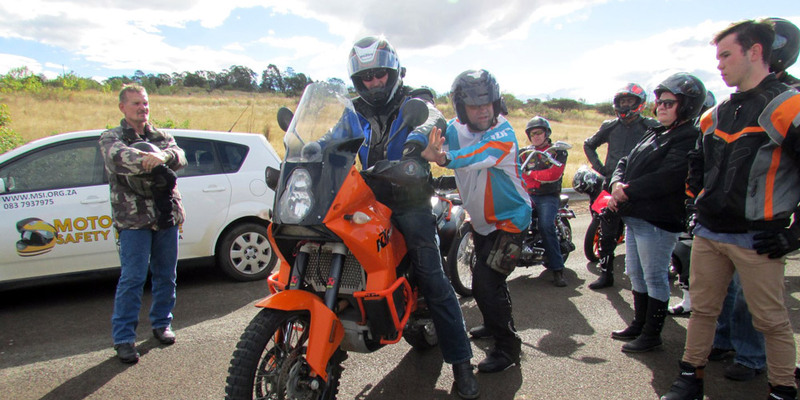 A full-face helmet and the impact-resistant armour in modern riding gear can make the difference between walking away from a crash and being carried away by medical personnel. You won’t find motorcycle muscles in an anatomy text, but you’ll know where every one of yours is after your first stint back in the saddle. Don’t get discouraged. Work your way up to longer rides gradually, and fit some stretching and light weight lifting into your day. Any sport that improves hand-eye coordination will cross over to your riding and help build endurance. After your long lay-off you have a lot to re-learn. Even today it’s not unusual to run into riders who swear using the front brake will flip the bike over on you. This is wrong, of course, but you’ll never convince these dinosaurs otherwise. Just remember where the dinosaurs wound up, and don’t think everything you “knew” years ago is still true. Riding techniques have evolved along with motorcycles, as have facts about tyres, brakes, and suspension. Come back to riding with an open mind and you’ll stay in it for good this time.